DJI has introduced two new drones, which are the most advanced devices ever from the company and the industry in general. They are the most powerful, but still an improvement of the original Mavic line. You will have to read about what separates their features before you notice it in real action. After several tests, you can now learn the differences between this latest version and earlier designs before you make the purchase. DJI’s commitment to bring the latest version of the drone to the customers is welcomed with appreciation to both casual and professional shooters. 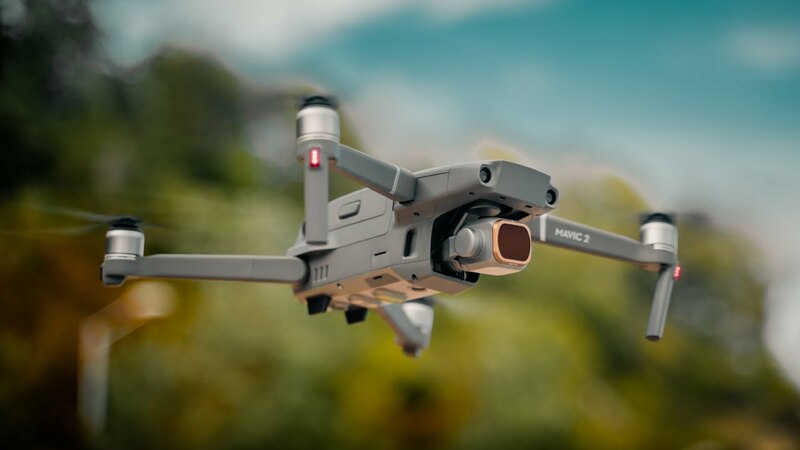 Apart from the cameras, the new DJI Mavic 2 Pro introduces several features, which make it an effective drone. For example, the raw flight specs have been improved immensely and seemed to be a focus of the engineers as well. They can, therefore, stay air-bone longer and fly faster than all their predecessors. This is what customers want to help shoot longer videos. In the future, there is hope that the technology will be advanced to make even longer trips. This version has a slight improvement of 2 more minutes and 4 more miles per hour. Nevertheless, it comes with better sensing ability. We all want amazing features on drones to improve our shooting and DJI is committed to providing customers with the latest possible innovations. For this reason, the software involved in the new Mavic 2 Pro improves precision. This transmission technology can allow you to see what the drone is viewing not only in real time but also in high quality. It comes with an environmental sensing system to sense-and-avoid obstacles. There are 10 sensors for omnidirectional activity in front and back, top and bottom, and right and left. One of the biggest benefits of the latest release in DJI’s series of drones is the environmental sensing system. With 10 sensors to keep, the drone stays smart while airborne by sensing and avoiding obstacles such as trees. This improvement is unequaled by previous versions. The new cameras introduced are the Hasselblad, which comes with a CMOS sensor and customizable aperture, alongside a smaller sensor zooming up to 48mm. The specs of the DJI Mavic 2 make it an evolutionary rather than a revolutionary device. The design and build quality are a pride to the brand. This is undeniably the sturdiest development of drone technology in our time. Although there is not much difference when it comes to form. There are minor and noticeable improvements as well. With extra sensors and a slightly larger device, the Mavic 2 Pro is already selling fast. The battery life and recharge has been boosted to 31 minutes in optimal conditions, which is an improvement from the previous maximum of 29 minutes. It is also faster than the original by up to 7 miles per hour, which is equivalent to 25kph, but who wants the speed anyway? Most customers love the new version because of piloting control. The new Mavic 2 Pro is not known to drift or lose control, which was a common problem with the predecessors. More importantly, customers expressed their delight in the ability to fly the drone with more vigor and confidence without fear of slipperiness. It is undoubtedly bottled to the sky. Although the improvement in time hovering in the sky is only a slight improvement, other features such as extra sensors to keep it safe from obstacles is a welcome to many shooters. The new DJI Mavic Pro Drone comes with advanced cameras and extra sensors. They maintain high-quality real-time pictures and can fly more aggressively without losing control. Thanks to the improvements, these gadgets are more durable too. The battery life has also been improved hence it can take you longer in your tasks with 2 more minutes of shooting time. It is also rugged enough to withstand scratches and bumps once in a while. Although it can take minor shocks, it would not be wise to try it out, but thanks to the sensors, there is little impact expected. It can avoid obstacles automatically while air-borne. On the downside, however, the Mavic 2 Pro is more expensive, yet it only brings minor improvements, which can be ignored by most of the users. For example, the additional speed limit and air-bone time is not a significant change to warrant ditching your old version for the latest one. Unless there is a serious improvement to the quadcopter, you would rather retain your previous version, the Mavic zoom. As long as you don’t crash it, the Mavic 2 Pro is durable enough to last you a long time. Of course, technology changes each year, so a new model is great for around 2 to 3 years when another upgrade may be needed. Can I use it in a crowded place? The Mavic 2 Pro is designed to sense and avoid obstacles, as long as there are not mischievous people or animals, you can use it confidently. Be aware of the issues regarding airports and privacy with your Mavic Pro. You are responsible for everything that you do with it. Where can I buy this gadget? It is available on Amazon and the official company website for online purchasing and shipping as well. If you can afford it, it is recommended as the best choice at the current time in 2019. The new DJI Mavic 2 Pro drone is undoubtedly an improvement of birds-eye view technology. It provides users with the latest technology advancements to enjoy new features. The engineers ensured the brand stays top of the game with the best build quality and durability. It is a reliable device with brick quality to withstand shocks and scratches. Most importantly, there is little chance of hitting obstacles, thanks to the 10 sensors introduced. Although not much has changed in terms of form, the general look and feel and of the new version remains the same until you try it out. It rides with more vigor and confidence and does not lose control.